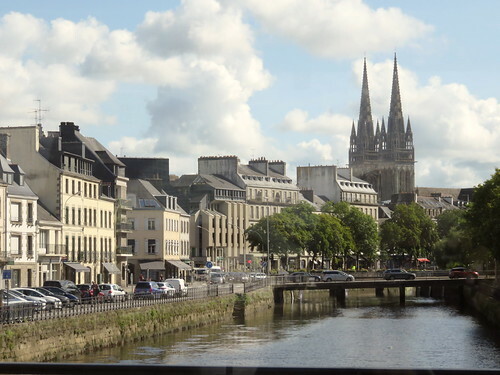 Quimper on the Odet and the Steir. The Cathedral of Saint-Corentin, with its Gothic-style façade, was constructed between the thirteenth and sixteenth centuries. It is the oldest Gothic structure in lower Brittany. Its two towers are 76 m (250 feet); its spires were added in the nineteenth century. The fifteenth-century stained glass windows are exceptional. The cathedral is dedicated to Quimper's first bishop, Corentin.